The Constitution of Malta acknowledges Catholicism as ‘the religion of Malta’, and arrogates to the Church the ‘right and duty’ to teach the values of right and wrong. How do you feel about the traditionally close liaisons between Church and State in Malta? Would a movement away from this status quo, also be a threat to the selfsame values of right and wrong? What the Constitution says exactly is that “the authorities of the Roman Catholic Apostolic Church have the right and duty to teach which principles are right and which are wrong”. The Catholic Church in Malta has, since time immemorial, been the expression of the spiritual values of the people. No doubt, a break away from that position will, I believe, bring about a substantial lowering of spiritual values which are not easily replaced by other spiritual values... given that I am of the opinion that those values are, at least, among the best, if not completely the best, human history has produced. 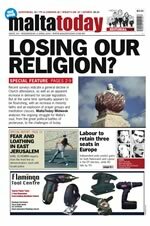 Recently there seems to have been a reassertion of Catholic authority precisely on the subject of ‘right and wrong’, with the Bishops of Malta and Gozo delivering last year’s Victory Day homily on the threat of secularism, and suggesting that a loss of faith would result in a ‘value-free society’. Are our social values inextricably linked to our presumed identity as a Catholic nation? I do not think that in recent years there has been a more noticeable reassertion of Catholic authority than any before throughout our long history. What is wrong for the Bishops to say that the threat of ‘secularism’ is indeed a threat to the Maltese society’s principles of what is right and what is wrong? Surely secularism tends to oust spirituality from human life, and when that happens there will be a lowering of ‘values’. Values after all have a moral content, and as such our moral beliefs and actions will have a ‘secular flavour’ which will surely be an impoverishment of our ‘spirituality’ as this is practically excluded by secularism which is only concerned with the here and now. Our ‘Catholic’ identity in the first two millennia of our history is clear. and I cannot see how one can declare it to be ‘presumed’. I can see that the Catholic part of that identity is now – i.e., since 1950 – being challenged by ‘illuminated’ fellow citizens, who will no doubt supply us with something else in substitution. However this will surely be not an element of identification, but an alignment with all the other European countries: surely nothing as ‘special’ as our Catholicism has proved to be, as the majority of nations have drifted away from the Church. We were not ‘special’ in Europe up until the Lutheran break-up. Is it possible to achieve what you would consider an acceptable ethical standard (on a personal level as a human being) without religion? Of course it is possible to ‘achieve an acceptable ethical standard’ without religion, if for instance, you are prepared to ‘accept’ as ethical the idea that you can indulge in ‘preventive’ wars based on a ‘very strong suspicion’ – almost as strong as sure knowledge; or accepting the quantification of the human being when you take it for granted that one American soldier is ‘surely’ worth more that at least two of another nationality (thousands will of course be too crude)... or, why not? Enjoying one’s sexual appetites with whoever takes your fancy, provided there is consent (up till now, perhaps, still demanded by current acceptable ethics). The list would be too long for this interview. To what extent should the rules and regulations of a religion like Catholicism be reflected in the country’s code of laws? For instance, is it desirable to have State laws against blasphemy? Censorship on the grounds of ‘offending religious sentiment’? Or for divorce to remain unobtainable from a Maltese court? All laws in all nations have a minimum of a moral content. The morality of those laws depends on what kind of morality to which that nation subscribes. If there is no ‘official’ morality, the matter will be left to the whims, ideas and the subjective morality of the individual judge. Hardly a satisfactory solution. Blasphemy depends on the feelings of the citizens who deem themselves to be offended by it. It can, and perhaps should be ignored. But this is a question of “popular” reactions. Once again, censorship is a question of whether the State wants to avoid popular resentment against the insolence of those who wish to provoke the religious sentiments of other citizens, who in turn wish to live undisturbed lives. If Denmark, on the publication of the Mohammed cartoons, wanted ‘peace’ it should have tested the case in Court; as it had done when the Jewish community felt insulted in the Jersild case which fizzled out in the Strasbourg Court. But censorship of the freedom of expression is subject to the clear rules mentioned in Art. 10  of the European Convention of Human Fundamental Rights and Freedoms. Divorce is a complex subject. From a secular point of view I think that the State has to take into consideration the implementation of the principle that if a marriage has broken down, a remedy should be forthcoming. But to what extent can this principle be accepted? Twice? Three times? Indefinitely...? The State has to see the implications of divorce. What has happened, and what is happening, in other countries seems to point out that divorce is undesirable for a State, as long as it is possible to avoid granting this unsavoury and egoistic ‘relief’ to the unsatisfied.